Short. Tall. Grande. Venti. And now, Trenta. Starbucks is introducing a 31-ounce cold cup. It’s a ridiculously large size. However, Starbucks would be ridiculous if they didn’t take advantage of a profit-rich upsell opportunity. Right? Ultimately it’s customers who will decide whether or not this is a ridiculous success (or failure). I’m betting customers will decide this is a good thing. Looks like the Starbucks Petri Dish experiment has ended for 15th Ave. Coffee & Tea. According to reports, Starbucks is returning/rebranding this location to become a Starbucks Coffee, again. Starbucks already scaled this [concept] into becoming the Starbucks we know today. Problem with scaling is COMPROMISE. Anytime a business “mass produces” something, compromises occur. Think of a recipe for homemade cookies. This recipe yields two dozen of the most delicious cookies ever. Scale that recipe to yield 80,000 dozen cookies every day and lots changes. Industrial ovens replace the household oven used. Bulk ingredients replace hand-picked ingredients. Complex systematic procedures insure each cookie is the same diameter, the same weight, the same everything when scale happens. After enough compromises and changes take place from scaling, the taste of the cookie changes. It just doesn’t taste the same. I bet McDonald’s used to make a very good hamburger. Not today. Scale happened. 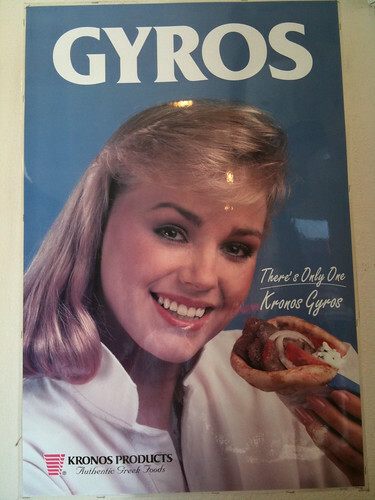 I bet Quiznos used to make a very good sandwich. Not today. Scale happened. I bet Taco Bell used to make a very good taco. Not today. Scale happened. Very few companies retain its specialness after it decides to scale. At some point, too many compromises are made for the sake of growth and all those nuanced compromises, when added together, result in a product that no longer resembles the original intent. That’s exactly where Starbucks is today. Maybe 15th Ave. Coffee & Tea will teach Starbucks all the compromises they’ve made to grow have truly changed the original intent of the company. The Starbucks Digital Network. Why Bother? Earlier this year Starbucks made Internet access totally free in all its company-owned U.S. stores. Now, Starbucks has launched the online Starbucks Digital Network, available exclusively in its U.S. locations. This network, according to a company press release, is "a collection of hand-picked premium news, entertainment and lifestyle content along with local insights and events. Developed for screens big and small, customers with Wi-Fi enabled laptops, tablets or smartphones can visit the network while in line or while enjoying their favorite beverage in the café." To bring this digital network to life, Starbucks, along with Yahoo!, is working with lots of content partners including: Apple, New York Times, Wall Street Journal, USA Today, Rodale (health and wellness publisher), LinkedIn, Zagat, and SnagFilms. Essentially, this is a "walled garden" of online content that Starbucks and Yahoo! will tightly control. 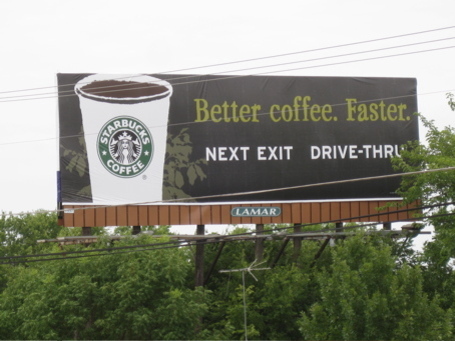 Mark Walsh from MediaPost questions the sanity of Starbucks digital network strategy. Mark remarks, "My initial reaction to the Starbucks digital hub is 'why?' Isn't free WiFi enough of an incentive to bring in customers who might otherwise not come to Starbucks? The swelling laptop and netbook population in stores since the company switched to free Web access in July attests to that." "Our customers are the inspiration for the Starbucks Digital Network. They’ve told us they want to be the first to know what’s happening in their neighborhoods and around the globe, to have an easy way to discover new music, great books and important films and find ways to be more involved in their communities. And they’re connecting with the brand digitally in numerous ways. These points combined with our passion for creating a unique customer experience, our heritage of recommending culturally-relevant works and focus on giving back to the community, led us to create this new, one-of-a-kind, localized content experience with Yahoo!." Let's get real. Here's the real why bother. "Our ancillary need for profit is the inspiration for the Starbucks Digital Network. The analysts working on Wall Street have told us we need a systematic way to discover new revenue, great profit and important mechanisms to financially leverage our community of customers. We're monetizing our customers with our brand digitally in numerous ways. These points combined with our passion for creating a unique revenue stream, our heritage of being a relevant high-growth stock and focus on giving back to the Wall Street community, led us to create this new, one-of-a-kind, monetizable experience with Yahoo!" Remember how Starbucks, in the early 2000s, spent too much of its time and talents trying to sell CDs, books, and movies to its customers? I remember. I also remember Starbucks selling real estate space inside its stores for Kozmo.com drop boxes. 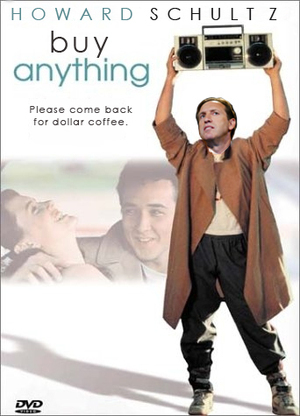 We can go further back and dig up Starbucks failed dot-com strategy from 1999, which cost the company millions. As it relates to the Starbucks Digital Network, rest assured, it is more about making money than fostering community. Starbucks contends it is not charging program partners $$$ to be involved with its network available exclusively to tens of millions of its affluent customers. While money may not be changing hands, Starbucks is sure to have bartered receiving advertising placements inside the pages of their newspaper partners and display ads on the websites of all their program partners. Starbucks will also benefit financially from money its customers spend with any content provider while on the network. All of this potential money making activity that's far outside Starbucks comfortable home of coffee troubles me today, just as it did in 2004 when Starbucks strayed from what it does best. Then, Geoffrey Moore, business strategist and venture capitalist, made a smart observation that applies today... "If Starbucks is just trying to find more ways to monetize the traffic that comes through, this is a bad idea. At some point the customers will start to feel abused." I'm afraid Starbucks, with it's newly launched Starbucks Digital Network, is falling victim to a proven failed strategy of trying to monetize its customers in ways unrelated to coffee. Why bother Starbucks? You already know how this will turn out. This conversation of balancing speed of service with soul of service isn't a new one for Starbucks. It's territory we've covered here many times (and its territory covered in my TOUGH LOVE screenplay about the drama surrounding a fictitious Starbucks known as Galaxy Coffee). Just a few years ago, Starbucks closed all its North American stores to retrain its Baristas on the "Art of Espresso" in hopes of finding a better speed/soul service balance. And today, the Wall Street Journal reports Starbucks is rolling out revised drink-making procedures designed to "make stores operate more efficiently." Seems to me the issue here is less about being efficient and more about being effective in serving better tasting drinks to customers. Former Starbucks President Jim Alling once said, "As much as we want to meet people's desire to produce beverages quickly, we also realize that people want a smile with their drink, that they don't want to feel rushed." If there is one lesson Starbucks has learned in its nearly 40-years of being in business, it's taste will always trump speed. Starbucks customers are paying a higher-price for a higher-quality coffee experience than can be found at a quick service restaurant (McDonald's, Dunkin Donuts, etc.) People will wait for a better-tasting cup of coffee. Similar to Starbucks, Galaxy Coffee wasn’t smart about social media. Internal memos and videos were leaked and used by detractors to belittle the company. On numerous occasions, a Galaxy Coffee Public Relations Executive failed to properly coach David Pearl on the new rules of engagement when talking to the media about the company. The result was Galaxy’s reputation suffered greatly and the company was positioned as being out-of-touch. My new business book is now published. It’s an ebook called, TOUGH LOVE: Scripting the Drive, Drama, and Decline of Galaxy Coffee. Wait. It’s not really a book and its more than an ebook. TOUGH LOVE is actually a screenplay masquerading as a business book. TOUGH LOVE reads just like a Hollywood screenplay with standard script format, seven main characters, and two plot lines that tell the story of how a rags-to-riches entrepreneur finds success building a company (Galaxy Coffee) to be bigger only to realize, the hard way, that smaller is better. Inserted throughout the TOUGH LOVE script are breakout business lessons and thought-provoking business advice geared towards entrepreneurs and small business owners. It’s available as a .pdf download from ChangeThis ... click below to purchase. You can learn more at ToughLoveScript.com; including a synopsis, character sketches, and an informative Q&A. There are so many more confusing elements... just watch the video and read Paul’s post on what went wrong and what should have gone right. It’s been almost two years since Starbucks jumped into the deep waters of social media with their MyStarbucksIdea.com program. This is a website where customers submit and discuss ideas on ways Starbucks can improve its business. Over 80,000 ideas have been submitted and late last year, Starbucks informed us over 50 ideas from customers have been implemented. Cool. Sounds great. Sounds impactful. But wait, let’s take a closer look at these customer-driven ideas Starbucks has "implemented." Of the 53 ideas Starbucks has "implemented," my closer look reveals only a handful of ideas, SIX to be exact, can be truly credited to customers. Many ideas Starbucks claims to have implemented from customers are either recycled products/programs Starbucks has done in the past or were clearly in the pipeline long before the customer idea was submitted. For example, Starbucks credits a customer idea for the Splash Sticks (#1 on the list) they offer customers to help ensure coffee doesn’t spill out of the plastic lid. Reality is this idea was being done in Japan months before its introduction into the North American market. It’s not a customer-generated idea because this idea was already in the Starbucks product pipeline. Starbucks also takes credit for responding to customer ideas for Free Wi-Fi access (#3). Not true. Wi-fi access at Starbucks isn’t free. There are hoops customers must jump through to get two-hours of free wi-fi a day at Starbucks. First hoop is to have a Starbucks Card. Second hoop is a minimum balance must be kept on the card. Third hoop is the card must have been used within 30-days. Then and only then can a Starbucks customer get “free” wi-fi. It’s fine for Starbucks to put restrictions on wi-fi access. It’s not fine to claim it listened to customers and now offers free wi-fi. It ain’t free if you have to jump through hoops and spend money. Starbucks takes credit for selling Reusable Cold Cups (#7, #30) because of a customer submitted idea. Hard to give credit to the customer idea for something that has long been part of the Starbucks merchandise mix. Starbucks has sold Cold Cups for years in all sorts of styles, colors, etc. They’re called Travel Tumblers and these cups can keep cold coffee cold and hot coffee hot. Same goes for giving credit to a customer idea spurring Starbucks to sell Venti-sized Travel Tumblers (#25, #53). Starbucks has sold such a product for over a decade. Starbucks also claims to have responded to the customer idea of bringing back Chantico Drinking Chocolate (#15). Try ordering Chantico today at Starbucks and all you’ll get are blank stares because Starbucks doesn’t sell drinking chocolate. What Starbucks has done is reformulated its hot chocolate beverage to contain more dark chocolate. The company can’t take credit for bringing back Chantico when all it did was reformulate its hot cocoa recipe. The most popular customer-generated idea is to offer “Great Conversations” (#14) by promoting community to foster in-store discussions between customers at Starbucks. Nice idea. Starbucks takes credit for implementing this idea by offering the GOOD Sheet. The GOOD Sheet you ask? It’s a pamphlet from the publishers of GOOD magazine discussing issues of cultural and societal importance. Good luck finding it at Starbucks these days, it might be discontinued, and better luck experiencing lively discussions between customers about the GOOD Sheet. Starbucks has responded to the customer ideas for offering healthier pastries which include: More Whole Grains (#8), Increase Healthy Options (#37), Gluten-Free Packaged Food (#27), Healthy High Protein Breakfast (#9), Gluten-Free Options (#10), and Vegan Options (#11). Notice any redundancies in the ideas? Of these six implemented ideas, I’ll credit Starbucks for implementing three of them (Increase Healthy Options, Gluten-Free Options, and High Protein Breakfast). Furthermore, of the 53 ideas "implemented," Starbucks takes credit for the ideas from Starbucks partners (employees) submissions. (Starbucks has an intra-company version of the MyStarbucksIdea website for partner submitted ideas.) Many of these ideas from store partners are worthwhile, but almost none of them impact the customer experience. Electronic Pay Stubs (#2), Discounted Work Wear (#6), and Employee Discount at StarbucksStore.com (#13) are some of these worthwhile ideas that have no impact on the customer experience. Because they have no impact from a customer perspective, Starbucks shouldn’t include these ideas in their tally. If we delete the customer ideas Starbucks already had in motion, the ideas Starbucks incorrectly takes credit for implementing, and the employee ideas ... then we are left with only SIX ideas implemented. And of these SIX ideas, none can be considered as having significant impact on the Starbucks business. My tough love for Starbucks is this: Don’t declare you’re going to be a different kind of company by getting customer input when you aren’t going to use it. It’s cheating to match programs/products you already have in the pipeline with the ideas submitted by customers. It’s also cheating to declare you’ve implemented customer ideas when clearly, you haven’t. Starbucks is too smart a company to cheat. So don’t. We conclude our short series highlighting Bryant Simon’s book, in EVERYTHING BUT THE COFFEE: Learning about America from Starbucks (University of California Press, 2009). BRYANT SIMON: Before I started my research, I found Starbucks to be an interesting place, most notably a potentially important public gathering spot in suburbanizing America. But the deeper I dug into the company’s history and charted its actions and located it within the context of the changes in American society, the more skeptical I became about the promises it made. My patience with the company snapped when I learned about its behavior (both the promises it made and its deeper indifference to what was actually going on) in Rwanda. Rwanda, as most people know, has had a mean and bloody past. Ethnic violence in the mid-1990s cost the nation, a former colony with a woefully underdeveloped economy and infrastructure, hundreds of thousands of lives. By 2000, the country was trying to get back on its feet and the coffee industry had the potential to help it and some of its farmers recover. Starbucks, it turned out, played on this history and this guilt – a western guilt over doing nothing to stop the killing – to sell some pricey coffee and make itself look better. These signs – again promises – got me interested in what Starbucks was actually doing in Rwanda. I asked around a bit and found out that while Starbucks charged $22/per pound for its coffee, it wasn’t paying any more at origin than other roasters buying Rwandan beans from small growers and charging consumers far less. Starbucks, moreover, wasn’t buying its bean from co-ops or small farmers, at least not directly. “These are plantation beans,” one source who knew something about the Rwandan coffee industry commented when I asked him about Starbucks purchases. When I asked him what he meant by this, he curtly answered, “I meant what I said.” Starbucks was buying beans from large shareholders, not small farmers, from powerful landowners with, in many cases, ties to old colonial authorities, not from the victims of the ethnic cleaning campaigns that ripped the country apart. So this was my Rwandan moment. To me, this was just too much. Manipulating the Rwandan tragedy to make money seemed totally out of bounds and nearly unethical. But even more, it demonstrated to me the utter ordinariness of Starbucks. It wasn’t that the company was exceptionally nefarious or greedy; it was that the company just like any other company, was willing to do just about anything and say just about anything to move product. We continue our short series highlighting Bryant Simon’s book, EVERYTHING BUT THE COFFEE: Learning about America from Starbucks (University of California Press, 2009). BRYANT SIMON: Many branders, following the lead of Joseph Pine and James Gilmore, argue that higher-end consumers are looking for experiences and wiling to pay extra to get them. I think about this idea in a slightly different way. I think we pay a premium to get the things that are missing in our lives – experience being just one of them (and I write about this in the chapter in my book on music and the feeling of discovery, both real and vicarious that Starbucks sells.) Back to my point, so I think that people increasingly buy to fulfill their desires or get a hold of the things that are missing in their lives. But there is another dynamic at work here. As other social forces – neighborhoods, community, unions, and politics – seem to recede, brands have stepped into our lives to offer more of the things that matter most to us – everything from authenticity to work spaces to belonging to social justice. Really, then brands sell promises – promises to fulfill our needs and desires. Yet, often they deliver only an illusion of what we need and want, some vapory facsimile that looks like the real thing, but usually isn’t even close. Few companies, in what we might call the “promise economy,” sell more -- e.g. promise more – than Starbucks. But again, the company doesn’t always deliver on its promises. Take the promise of Third Place. Starbucks has borrowed – expropriated -- this phrase from the sociologist Ray Oldenburg. 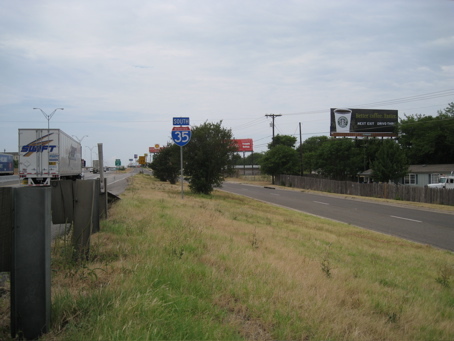 Oldenburg calls these locations real – not virtual -- sites between work and home where people can gather. Starbucks serves this role, but back to the question, in only the thinnest, most ephemeral of ways. To Oldenburg, third places are social setting where strangers meet and forge the bonds of community. Once they trust each other, they go on to discuss matters of crucial import to the community. Talk is essential for these places to genuinely work. But that isn’t really what happens at Starbucks. People come to Starbucks to get a moment of respite or to meet with colleagues, but rarely do they engage in the kinds of community discussions needed to bolster civic life. So what they get at Starbucks, is a busy, chatty looking place that looks like a third place, but isn’t really a third place. Kind of like those cup quotes. Remember when Starbucks tattooed its cups with quotes? They were there the company said to encourage conversation and community, but they didn’t say much that could get anyone to actually talk or engage with others. Who isn’t in favor of finding love, the rainbow of colors, and the innocence of kids playing baseball? When the cups did incite a little controversy, Starbucks pulled the offending cups. That’s not free speech, and free speech is key to Third Places and to community. Just ask Ray Oldenburg. These are two examples of promises that Starbucks makes – because the ideas they promise have value to their customers and add value to their products – but doesn’t entirely fulfill. And this is one of the avenues of inquiry I explore in my book. I look hard at what Starbucks sells and what it actually delivers. I first met Bryant Simon in 2006. At that time, he was in the early stages of researching Starbucks impact on culture and consumerism. We traded emails about nuanced Starbucks happenings from store-level operations to broader marketing matters. He was curious to learn the rationale behind a lot of the decisions he was experiencing in Starbucks stores. 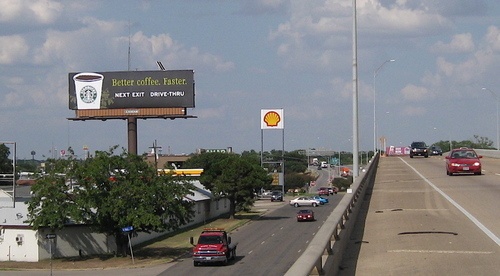 As a former Starbucks marketer known for sharing tribal knowledge about the company, I enjoyed my email threads with him and my face time with him when he visited Austin in 2007. Since he’s a history professor at Temple University, Bryant comes at the Starbucks story from a unique angle. He uses this unique perspective to make interesting observations about Starbucks. After a few years of research and thousands of hours spent observing Starbucks from hundreds of its stores, Bryant Simon has released his observations on Starbucks in EVERYTHING BUT THE COFFEE: Learning about America from Starbucks (University of California Press, 2009). It’s a worthwhile read. We’ll be sharing Bryant’s take on Starbucks impact on culture and consumption over the next three days. More to come on Thursday and Friday. In a post from Feb. 2008 I mentioned how this video "works great as a recruitment video. Not slick. Not scripted. Just genuine moments and reflections..." I also mentioned how Starbucks should STRONGLY CONSIDER encouraging its young and talented workforce to post videos of why they feel a connection to Starbucks similar to the brilliant Deloitte & Touche Film Fest idea. More ideas from Starbucks empowering its talented workforce to showcase personality will go a long way in not just helping recruiting new employees but also in recruiting some lost customers to believe in the company again. A Starbucks location once destined for closure has re-emerged as 15th Ave. Coffee & Tea. No Starbucks logo. No venti-sized cups. No sassy promotional signage. No automated espresso machines. The location is designed to look, feel, and act not like a Starbucks, but rather a one-off local boutique coffee shop. On the surface, it appears to be an odd move. Why spend so many years building a global brand only to reject most everything about it? The answer … TO LEARN. 15th Ave. Coffee & Tea is not a growth vehicle for Starbucks. Can’t be. It’s too expensive and time-intensive to scale. It can only be viewed as a learning opportunity for Starbucks. Perhaps some of the learnings on how to add personal touches will find its way back into the Starbucks experience thanks to the company’s petri dish known as 15th Ave. Coffee & Tea. By now you’ve heard Starbucks is introducing an instant coffee product. It’s a just add water and stir packet called VIA. Okay. Fine. That’s cool. Starbucks has long-dabbled with concentrated instant coffee. For the past ten years, the Frappuccino ice-blended drinks you’ve been enjoying have been made using a powdered coffee concentrate. And the bottled Frappuccino drink from Pepsi uses concentrated coffee as its base. So concentrated instant coffee isn’t new for Starbucks. What is new … is how Starbucks is positioning this product. Howard Schultz, Starbucks ceo and chairman, is talking about how VIA will "disrupt and reinvent the instant coffee category." That’s right, "disrupt and reinvent the instant coffee category." Hmm … priorities seem to be misplaced. Shouldn’t Starbucks be more concerned with disrupting and reinventing their core retail business and not the instant coffee category? Lack of rejuvenating their core retail business has resulted in closing nearly 1,000 locations, the loss of almost 6,000 jobs, and the marginalization of the Starbucks brand. Selling instant coffee isn’t an instant fix to solving Starbucks problems. It’s a distraction, not a solution. His post continues by declaring pretentious coffee is out and affordable coffee is in. Right on, I agree with his point given today’s dismal economy. The comments to his post are lively and run wild. Definitely worth reading. In the comments, Ted mentions how “Eight O'Clock beat out Starbucks. Go figure.” This triggered a long-dormant thought that is no longer dormant. Read below for my comment to Ted on this. Ted … I gotta chime in again. You mentioned how 8 o’Clock Coffee beat Starbucks Coffee on taste. True. And Dunkin’ Donuts is touting the taste of its coffee is preferred over Starbucks. Yep. Got it. Starbucks has never fared well in taste tests. That’s because the taste of Starbucks coffee is too polarizing. Many people say Starbucks coffee tastes too bitter, too burnt, too bold. Starbucks has always had a strong point-of-view about what coffee should taste like. That strong point-of-view about coffee has helped to build its brand. In the book PURPLE COW, Seth Godin smartly writes … “In almost every market, the boring slot is filled. The product designed to appeal to the largest possible audience already exists, and displacing it is awfully difficult. The real growth comes with products that annoy, offend, don't appeal, are too expensive, too cheap, too heavy, too complicated, too simple — too something." 8 o’Clock Coffee makes boring coffee. Boring coffee is not going to annoy, nor will it offend people. Conversely, non-boring coffee will annoy and offend people. 8 o’Clock Coffee has never been a growth brand. Starbucks, with its non-boring taste profile, has been a growth brand. HAS BEEN, being emphasized. I offer up that Starbucks has been slouching towards boring coffee for years. The biggest coffee push from the company recently has been behind Pike Place Roast. This is a mild coffee meant to appeal to the masses, which means it’s meant to be boring. Problem is, the Starbucks brand was built on strong, polarizing coffee … not boring coffee. As Starbucks has grown to over 16,000 locations worldwide, it has tried to tone down its strong point-of-view on coffee in order to appeal to even more people. In my opinion, that’s hurt more than it has helped. The company has abandoned its strong point-of-view about how “good” coffee should taste. This abandonment has wrecked havoc on its brand. In its attempt to appeal to everyone, Starbucks has lost those someones who enjoyed a coffee taste profile that isn’t watered down to a milder, more palatable and less offending taste. Back in the day, the coffee Starbucks served earned an opinion from people because it wasn’t boring. These days, the company serves boring coffee (Pike Place Roast) and it no longer has a strong point of view about how good coffee should taste. It’s my take … focusing on boring coffee has, more than the dismal economy, positioned Starbucks for the steep decline its experiencing. "It is my sense that Starbucks has lost its way, and that blaming the economic downturn misses the point. After all, great brands and great thought leaders find ways to transcend these kinds of challenges, profound as they may be. They find ways to reinforce the differential advantages of the brand, and to see the challenges and opportunities for strategic innovation. Starbucks Has Nothing To Lose - Freakin’ Go For It! Looking to bring more value-seeking consumers through its doors for a late afternoon caffeine fix, Starbucks Corp. said it will now offer its morning customers any iced grande beverage for $2 after 2 p.m. The price is a big cut from the normal price of most grande-sized iced drinks. A grande iced latte, for example, costs about $4. To get the discount, customers must present a receipt from their morning Starbucks visit. "I think we've kind of hit the nail on the head," said Brad Stevens, vice president of customer relationship management. "It's easy for baristas to implement and it's easy for customers to understand." As marketers, we know PRICING TELLS A STORY. All high-priced products must deliver an interesting story to justify its higher price. On the other end, low-priced products settle for telling an uninteresting story, beyond simply getting goods on the cheap. Reading in-between the lines I’m picking up on something even more alarming than the company’s decision to become a priced-to-sell retailer. I’m picking up on a cataclysmic shift in company culture. The Starbucks company culture has never been about doing things the easy way. The easy way is to size drinks Small, Medium, Large, and Extra-Large. The easy way is to roast coffee less for a mass appeal taste profile. The easy way is to have lucy-goosey espresso making standards. The easy way is to not offer part-time employees full benefits. The easy way is to treat customers as just a transaction. The easy way is to compete on low prices. The hard way is to size drinks Short, Tall, Grande, and Venti. The hard way is to roast coffee longer for a more polarizing taste profile. The hard way is to have strict espresso making standards. The hard way is to offer every employee full benefits. The hard way is to have employees build relationships with customers. The hard way is to compete on high prices. If we wanted “easy,” we would have never interrupted our old daily ritual to make Starbucks part of our new daily ritual. If Starbucks had always done things the EASY WAY, they wouldn’t have changed the game for how to build an endearing and enduring brand. As for the decision to compete on low prices to drive traffic in the afternoon daypart with Treat Receipts … I’m troubled by this. Just as I was troubled when the company experimented earlier this year with selling a One-Dollar Cup o’ Joe. Consider peeping the July issue of ARCHITECT magazine. The magazine asked five architect design firms to envision the rebirth of Starbucks. Interesting results ... lots of daydreaming esoteric fodder for design-types. 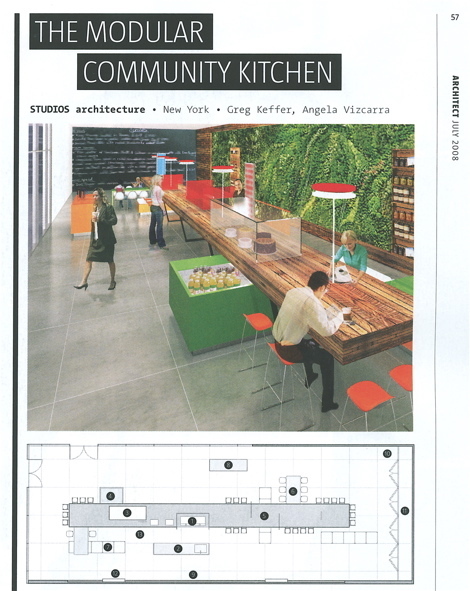 The regular marketing-type in me likes the Modular Community Kitchen design from Studios Architecture. CLICK HERE to review all five rebirthing Starbucks design ideas. Now that it is going away, we’re devastated. As many of you know, I will occasionally ask if you would miss a specific company if it went out-of-business tomorrow. (It’s part of my Would You Miss series inspired by the book, MAVERICKS AT WORK.) The question is totally hypothetical, but the answers you’ve given are highly emotional. This “Would You Miss” question is a great one to ask of any business because it tells us how well we have formed relationships with our customers. If a business has formed unfailing relationships with its customers, then customers would truly care if that company went out of business. On the other hand, if a business hasn’t formed meaningful bonds with customers, then customers wouldn’t care if that business ceased to exist. With the recent announcement of Starbucks Coffee closing 600 under-performing locations, we get to witness this “Would You Miss” question in action. If the SaveOurStarbucks.com website is any indication, lots of people will miss Starbucks when their location is closed. Wow! “Now that it is going away, we’re devastated.” That’s the best thing a company could hope to hear from customers when it is dealing with severe business issues. Hmm ... would your customers be DEVASTATED if your business closed up shop? Big news went down yesterday. Starbucks is closing 600 existing locations, cutting new store openings even further, and significantly reducing its workforce. This is on top of recently announcing a major reduction in their Starbucks Entertainment foray. It’s official … Starbucks is no longer in growth mode. They are in PRUNE MODE. Paul’s analogy to restoring the Starbucks brand luster, like one would restore antique furniture, got me thinking about gardening. Paul and I once played around with this gardening analogy back in the day. We were probably chomping on a Briazz sandwich at Starbucks HQ when we began drawing the connections between the role of gardener and our role as marketers. The seeds of the business were first planted in 1971 with the three original founders of Starbucks playing the role of company gardener. As company gardeners, they carefully worked with the soil in the Pacific Northwest until it became fertile ground. At first, the soil wasn’t fertile enough for the roots of the company to take hold and grow. But after years of dedication and daily nurturing, the hard soil became fertile and Starbucks began to not only grow deep, healthy roots—it also began to blossom. By 1992, the Starbucks garden landscape was thriving with new growth happening. Throughout the 90s, Starbucks flowers were always in full bloom and its garden landscape was growing, and growing, and growing. Today, the Starbucks garden is still growing, but its growth is unwieldy. Company gardeners are having a hard time managing the garden’s growth. An increasing number of new plants have sprouted in the Starbucks garden that do not belong there. Coffee plants have always grown in the Starbucks garden but today, there are more and more plants in the garden that resemble nothing like coffee. The Starbucks garden has become so cluttered by wildflowers and weeds that it’s hard to recognize where the coffee plants are. Because of the wildflower and weed clutter, the Starbucks garden has lost its identity. It’s become apparent—the Starbucks garden needs major maintenance. It needs pruning. Pruning promotes healthy growth. By pruning, gardeners are able to remove unwanted, unneeded, and unhealthy plants as well as limbs from trees. This reduction of plants and tree limbs will allow for more light and air into the garden, thus allowing for wanted and needed plants to grow in a healthy, sustainable manner. To promote healthy growth, Starbucks needs to prune its business by removing unwanted, unneeded, and unhealthy elements from its business. Prune its Merchandise assortment. Prune its Entertainment division. Prune its New Store expansion. Prune its Automation Efficiency projects. Prune its partnership with Jim Beam. Prune everything that is causing Starbucks to lose its identity of sourcing, roasting, and serving the highest-quality coffee. For those seeking extra credit, read the entire SOLVING STARBUCKS PROBLEMS series of posts. Those in the medical field understand AMNESIA is a profound memory loss, usually the result of a traumatic event. Patients suffering from Amnesia have severe difficulty learning new information as well as remembering facts, events, and past experiences. Amnesia isn’t fatal. However, memory loss can be severe enough to require daily supervision from a caretaker. Coping rather than healing is the best case scenario for those suffering from Amnesia to live a somewhat productive life. Marketing practitioners understand businesses can suffer from BRAND AMNESIA. When a business forgets its identity, disregards past learnings, and fails to learn new information … it has contracted BRAND AMNESIA. I’m reminded of this marketing affliction from reading Janet Adamy’s dissection in the Wall Street Journal of Starbucks attempt to introduce a milder everyday coffee. While Starbucks doesn’t admit it, the focus on milder everyday coffee is in response to the encroaching competition of Dunkin’ Donuts and McDonald’s. Taste tests show Starbucks bolder flavors are polarizing and McDonald’s coffee has a more appealing taste. As a marketing practitioner who has kept a detailed “Starbucks Marketing History” folder, this sounds like Déjà-Vu all over again. In the late 90's, Starbucks was hearing the same comments, mainly from the East Coast, that their bolder coffees were too polarizing and to acquire new customers, the company needed to address the “Charbucks” issue. In response, Starbucks introduced Milder Dimensions in 1998. According to then Sr. Coffee VP, Mary Williams, Starbucks “… created Milder Dimensions(tm) in response to customer requests to experience a lighter Starbucks coffee. The milder flavor profile of this family offers the perfect introduction to Starbucks, as well as providing more coffee options without compromising quality." Long story made short … despite its heavy in-store and out-of-store marketing attempts, Starbucks Milder Dimensions became a footnote in the company’s history. Customers never truly embraced the softer and simpler taste profile of this lighter-roasted coffee. Worse yet, Starbucks Partners (employees) never fully embraced the Milder Dimensions coffees because they believed the company’s identity is about bolder tastes and not lighter tastes. By 2003, after suffering through years of lethargic sales, the Milder Dimensions category was discontinued. Ten years later, Starbucks repeats itself by introducing an updated version of its failed Milder Dimensions coffee—Pike Place Roast. As noted in the Wall Street Journal article, Starbucks customers have voiced displeasure with this softer and simpler coffee. And negative comments from Starbucks Partners litter the StarbucksGossip blog. Marketing and medical practitioners know one’s history foretells one’s future. Milder Dimensions didn’t work in 1998 and Pike Place Roast isn’t going to work in 2008. With hints of marketing dementia, Starbucks executives are declaring Pike Place Roast a success because drip coffee sales are on the rise. However, my unofficial Marketing Resonance Imaging (MRI) tests reveal fissures in Starbucks thinking. Since Starbucks rarely promotes brewed coffee with in-store signage and out-of-store advertising, a reasonable assumption is that brewed coffee sales would increase even if it was Sumatra being promoted and not Pike Place Roast. The economic downturn also comes into play. With a sluggish economy, consumers are finding ways to trade down to lesser expensive options. It makes logical sense some Starbucks customers are forgoing their $4.25 Latte for a $1.80 cup of brewed coffee. Furthermore, if indeed Pike Place Roast was a success, the company wouldn’t be backtracking and re-introducing bolder brewed coffee options in the afternoon. Let’s circle back to the BRAND AMNESIA affliction. Businesses that suffer from Brand Amnesia experience profound memory loss, most likely from a traumatic event. Its clear Starbucks forgot its past history with the failed Milder Dimensions coffee line-up. Was there a traumatic event that caused Starbucks to begin suffering from Brand Amnesia? Traumatic doesn’t begin to describe how Starbucks has seen its stock price lose more than half its value in the past year, its earnings greatly diminished, and most traumatic … a significant drop in the number of customers visiting Starbucks in 2008 compared to 2007. Here’s hoping Starbucks finds daily caretakers that are fully aware of the company’s history and can help the company cope with the onset of BRAND AMNESIA. We know about the MyStarbucksIdea website, which Starbucks positions as a catch-all blog, customer feedback site, and social networking website. The reality is that website is an unfocused slush pile for customer generated ideas. But how many of us know about Starbucks V2V? 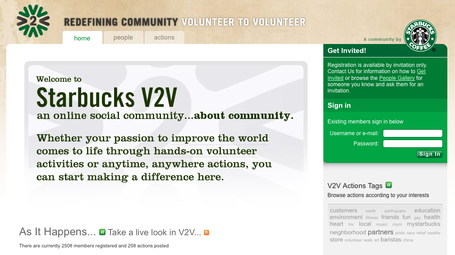 It’s a full-fledged social networking site to promote volunteerism with customers and Starbucks partners (employees). It’s under the radar at this point — participation solely by invitation — and has only been mentioned officially by the company as an update entry on MyStarbucksIdea. Think Meetup meets LinkedIn and there you have Starbucks V2V (Volunteer 2 Volunteer). You can post a cause, an event, or an activity and have others join you. Easy enough to understand and simple enough to make happen. Starbucks V2V has real promise. It’s clearly community-focused with a drive to making positive contributions to small corners around the world. By having profile pages for participants, it feels much more personal than does the way-too-sterile MyStarbucksIdea website. If you dig a little deeper you’ll learn Starbucks V2V began in Brazil using technology developed by Comunitas. In a way, this is an International “best practice” that has been adopted by Starbucks North America. Cool. My hope is Starbucks uses this full-fledged social networking site to endorse and develop a long-rumored “Starbucks Alumni” website. For years Starbucks has talked about setting up an Alumni network, but the job was always too daunting to begin. The technology clearly exists and the online usability is sufficient … which makes this Starbucks Alumni idea totally doable in 2008. Why nurture relationships with ex-employees? Well, many new hires at Starbucks were influenced by former Starbucks partners. Most ex-Starbucks employees had a positive time at the company and they’ve said good things to their friends about Starbucks. And for some of us, including me as a former Starbucks partner, we shared a common bond during our days at Starbucks. Reconnecting with former Starbucks colleagues on a company-endorsed website could potentially reignite the passions we all once had for Starbucks. That reignition of passion is something Starbucks could benefit from as it suffers through its “mid-life” crisis. Just got off the phone with a journalist writing a story about some of the marketing lessons I share in TRIBAL KNOWLEDGE. The journalist put together some tasty pull quotes from the book to help direct our conversation. And since I'm obviously suffering from a severe case of blog drought, below are the money quotes the journalist pulled. Enjoy. Net income for Q2 2008 at Starbucks fell by $42-million compared to the same quarter last year. (Ouch.) Additionally, Starbucks is drastically reducing the number of new store openings in the U.S. Starbucks opened nearly 1,800 locations in 2007. For 2008 the company will open only 1,175 new locations — that’s a 35% reduction in new store openings from the prior year. And, beginning in 2009 through 2011, Starbucks will limit new store openings to only 400 per year. Clearly the company is experiencing growth troubles in the U.S. However, Starbucks is hoping to offset the slower domestic growth with greater international growth. Starbucks is set to open up anywhere from 1,050 to 1,300 new international locations each year through 2011. Nathan Snell runs the social media voodoo down with smart analysis of MyStarbucksIdea.com. And when you read Shel Holtz's take on how Starbucks mirrors Dell, be sure to read the comments where Caroline Dietz from Dell provides clarification. If you have no idea why I am blogging this, read this. Since I have lots of HMOs (hot marketing opinions) about Starbucks, reckon I should share my take on today’s major goings-on with the company. Since there’s lots to talk about, I’ve arranged my thoughts in a “WHAT | SO WHAT | WHAT TO THINK” format. At its 2008 Shareholders Meeting, Starbucks announced six initiatives designed to: (a) improve the current state of its U.S. business, (b) reignite the emotional connection with customers, and (c) invest for long-term success. Starbucks will phase out its current automated espresso machine, known as the Verisimo, for a higher-quality automated machine. The new Mastrena machine is also an automated machine, but Starbucks believes the quality of espresso and steamed milk is superior to that of their current machine. Starbucks plans to have the Mastreno in 30% of U.S. locations by the end of 2008 and in 70% of U.S. locations by 2010. Starbucks will further its relationship with Conservation International in a variety of ways. Customers will notice this relationship with a certification seal on select coffees judged to have been grown and sourced using stringent standards. By the end of 2009, every Starbucks espresso drink prepared around the world will be used with coffee beans certified by Conservation International as being ethically grown and sourced. Starbucks is following the lead of companies like Dell by introducing a website where customers can submit their ideas on how Starbucks can improve its business. MyStarbucksIdea.com is the company’s first meaningful foray into social media. Howard Schultz will blog here and 48 Starbucks employees will be assigned to engage in conversations with customers on the website. Additionally, Starbucks Card customers will also receive 2-hours of free daily in-store wi-fi, free refills on brewed coffee, and a free 12-oz. beverage (espresso, coffee, or Frappuccino) when they buy a pound of whole bean coffee. These are only the initial rewards Starbucks Card holders are set to receive in April. The company plans to add-on more rewards in the months to come. Starbucks is changing its policies for brewing coffee in-store. They will be brewing in smaller batches and reducing the hold time for brewed coffee from 60-minutes to 30-minutes. Plus, the company will no longer rely on pre-packaged ground coffee filter packs and instead, grind whole bean coffees in-store to brew as drip coffee. A new blend, Pike Place Roast, will be introduced and brewed as an everyday coffee. Coffee geeks rave about the Clover Brewer and high-end coffee shops have been using the Clover Brewer to brew richer, more flavorful coffee. Starbucks has been selling brewed coffee using the Clover Brewer in selected locations in Seattle and Boston. Results of the test have been promising. So promising, Starbucks is acquiring the Coffee Equipment Company, makers of the Clover Brewer. Starbucks has plans to rollout the Clover Brewer to a limited number of locations. UPDATE: to watch the Clover Brewer in action, click here. We were promised to learn of transformational initiatives that would reverse the negatives trends impacting the company. We learned of six initiatives. I'm not sure how transformational these initiatives will be. 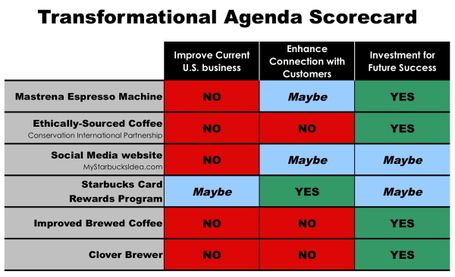 Let’s judge these transformational initiatives against the objectives Starbucks outlined at the Shareholders Meetings. Will these six ideas (a) improve the current state of its US business, (b) reignite the emotional connection with customers, and (c) invest for long-term success. The introduction of the Mastrena espresso machine is clearly an investment for long-term success. Starbucks says they will roll-out this new machine to 30% of its U.S. locations by year’s end. We’re talking over 2,000 locations—that’s highly aggressive. Given all the issues of production, distribution, installation, and employee training, Starbucks will be fortunate to have the Mastrena espresso machine in 1,000 locations by year’s end. Expect this new espresso machine to have little financial impact on Starbucks business in 2008. As for reigniting the emotional connection with customers … that’s hard to measure. Let’s just say friendlier Starbucks baristas will reignite the emotional connection with customers more than an espresso machine ever could. It’ll be 2009, when espresso drinks are made with Conservation International certified coffees, before this initiative can improve Starbucks U.S. business. With customers that value environmental issues and origin country matters, this initiative will help to build a stronger emotional connection with them. I’m not sure how many Starbucks customers are emotionally-tied to such issues. However, any activity designed to be friendlier to the environment and to coffee origin countries will be a good long-term investment. So we are to believe Starbucks is unaware of Dell’s social media activities with Direct2Dell and more importantly, IdeaStorm. Starbucks can learn a lot from what Dell has done and is doing with social media to better connect with customers. Time will tell if Starbucks customers are engaged by this online activity. Time will also tell if Starbucks corporate culture will adapt to social media and when (or if) Starbucks will implement customer ideas. Right now the most popular customer generated idea is for the company to implement a Buy 9 Drinks Get 1 Free punch card. That’s a marketing activity the company abolished a long time ago. How will Starbucks respond now? Clearly, Starbucks is seeking to drive sales by getting current customers to buy more, more often. Offering Starbucks Card customers free syrups and free refills is just the first step in what looks to be a more involved “loyalty program.” This has the potential to drive sales in 2008 and to reignite the connection with customers. The future is a different story. Once Starbucks heads down the path of offering customers discounts, they will have a hard time ever reversing course. The vast majority of beverage sales at Starbucks, as measured by total dollars, come from espresso drinks, not brewed coffee. Improving their brewed coffee policies is a positive move that the company should have made years ago. Will these changes, including the introduction of Pike Place Roast as an everyday coffee, move the sales needle? No. Improve the emotional connection with customers? No. Be a sound investment for the future? Yes. These new high-end brewers will only impact a small number of stores. Since these brewers make single cups of coffee on-demand, volume selling of drip coffee will not be possible. The Clover brewer will not have an immediate impact on sales in 2008. It does have the potential to impact the future business of Starbucks. Because this appeals to only coffee connoisseurs, I’m not convinced the typical Starbucks customer will care. It appears these six initiatives will have an impact on the long-term Starbucks business, but the short-term impact is minimal. That’s my take. What’s yours? And yes, I do need to get a life. No I’m not talking about the re-training of its front-line employees on how to make the perfect coffee drink. I am talking about a video ditty I spied on YouTube. 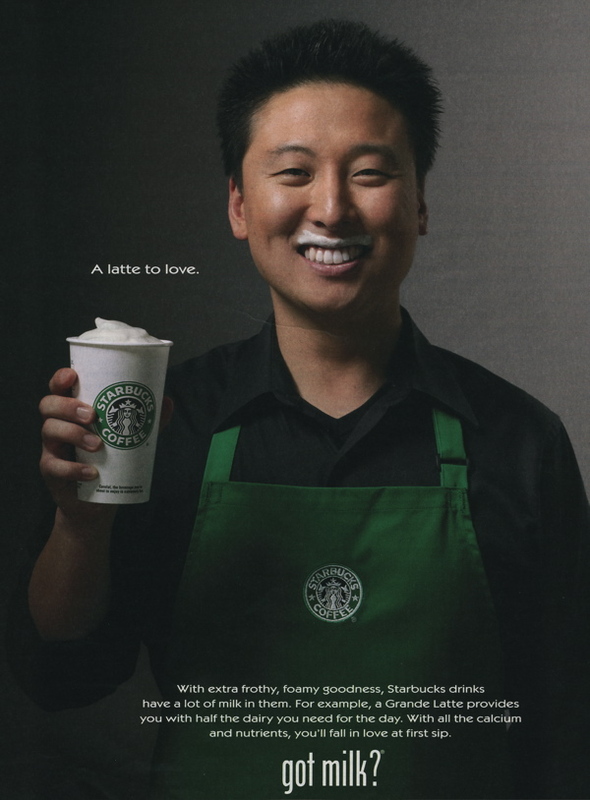 It’s a two-minute documentary of Young Han, a Starbucks barista, talking about his “Got Milk” photo shoot and his appreciation for the Starbucks Coffee Company. While Howard Schultz may never blog, Starbucks should STRONGLY CONSIDER encouraging its young and talented workforce to post videos of why they feel a connection to Starbucks. They could turn it into a contest similar to Deloitte & Touche’s brilliant Film Fest idea where Starbucks baristas would submit short videos showcasing “What Starbucks Means to Me.” The best 10 videos would be posted on the barren Starbucks YouTube page for all to see. Each of these top 10 videos would serve as a great recruitment tool for Starbucks. And the creators of these videos could be rewarded in some way, perhaps stock options. A simple idea to execute with potentially big results of attracting a better front-line employee to deliver better customer experiences. Starbucks CEO Howard Schultz once said, “Our marketing will emphasize quality and service, not price.” He’s now doing something different. “Starbucks fiercely protects its pricing power because it knows a low-price strategy is the quickest pathway to commoditizing and marginalizing coffee back to being, well, just coffee. It also knows if it lowers prices, it will have a hard time ever raising them again. Most important of all, Starbucks knows higher prices bring them healthier profit margins, which fuel the cozy experience customers enjoy. Those words were written in TRIBAL KNOWLEDGE, my love story to a company that shaped how I approach marketing. In my eight-years there, we, Starbucks marketers, would have never considered promoting a $1 Cup o’Joe to increase sales. Instead, we would have used of a combination of these ideas to solve for Starbucks problems. A "cheap coffee strategy" ... Oh My! is right; because, a low-price strategy is indeed the quickest pathway to commoditizing and marginalizing coffee back to being, well, just coffee. UPDATE: For an editorial-like cartoon on this "One Buck" Buck strategy, peep this. Last year about this time Micheal Dell returned to his CEO post at the company he founded. Under Kevin Rollins’s CEO leadership, Dell’s market share hit a four-year low and growth prospects were grim. Rollins resigned and Dell reclaimed his CEO role. Last year about this time Howard Schultz sent a memo to his Starbucks executive team challenging them to get smarter about how they are running the company and to get back to the company's core business. Starbucks CEO Jim Donald was charged with driving sales and driving innovation at the company. In 2007, Starbucks stock value fell 48% and the company reported its first every year-over-year drop in customer traffic. Donald is out and Schultz is back as CEO. The jury is still deliberating on Michael Dell and the turnaround of his company. The jury is just convening about Howard Schultz and the turnaround of his company. For the most riveting and rambunctious discussion about this unexpected CEO change-over at Starbucks, read the comments on the Starbucks Gossip blog. Sensing an opportunity to further democratize espresso, McDonald’s is moving full throttle into the espresso beverage business. Currently, 800 of McDonald’s U.S. locations offer lattes, cappuccinos, and frappes. By 2009, most U.S. McDonald’s locations will be selling coffee drinks ranging in price from $1.99 to $3.29. McDonald’s believes an expanded coffee menu will add about $1-billion in yearly sales. The program attempts to replicate the Starbucks experience in many ways -- starting with borrowing the barista moniker. Espresso machines will be displayed at the front counters, a big shift for a company that has always hidden its food assembly from customers. McDonald's says it wants customers to see the coffee beans being ground and baristas topping the mochas and Frappes with whipped cream. "You create a little bit more of a theater there," says John Betts, McDonald's vice president of national beverage strategy. The people component to delivering customer experiences is ultra-important to McDonald’s — more important than the actual coffee beverage program. Why? Because Starbucks competitors can replicate products and programs, but they can’t replicate people. Ambitious coffee competitors like Caribou Coffee, Cosi’s, Tully’s Coffee, Gloria Jean’s, Barnies, CC’s Coffee House, and others have all tried to mimic Starbucks success in some way. And they have all fallen short in some way. These coffee companies have tried and are trying to replicate the products and experiences Starbucks delivers, but they can’t replicate the people Starbucks has delivering the products and experiences to customers. Products do not create brands, people create brands. It’s the people that matter more in creating a brand than the product itself. And Starbucks places a tremendous emphasis on hiring the right people to deliver exceptional products and meaningful experiences to customers. When hiring employees for store-level and corporate-level positions, Starbucks looks for the following upstanding “people” qualities in each candidate: genuineness, conscientiousness, knowledge, and involvement. Genuine people build solid relationships with others because they are approachable and likeable. Starbucks employees who are genuine make for great team members, and they can be trusted to deliver heartfelt customer service. A conscientious employee is one who is considerate and pays attention to seemingly insignificant details because everything matters to them. And since “everything matters” at Starbucks, this quality is of utmost importance in all employees Starbucks chooses to hire. Starbucks employees are expected to know coffee to the extent that they will confidently share their coffee knowledge with customers. To find employees with this quality, Starbucks looks for people who ask questions. Asking questions at Starbucks is not a sign of weakness. It’s a sign of strength. Inquisitive employees lead to knowledgeable employees and knowledgeable employees are quicker to share their expertise with others. Employees who get involved within the company and within their community are valued at Starbucks. When employees take the time to get involved and make connections with others, they showcase a caring soul. Starbucks seeks to hire caring souls because they are more likely to make emotional connections with people. Even if McDonald's can successfully change its company culture to hire engaging employees, it still must solve for how to integrate its highly-involved coffee program with its streamlined operations customer have come to expect. As a leading authority on customer evangelism and word-of-mouth marketing, Jackie Huba has added her voice to the discussion about the problems Starbucks is facing. She highlights how Starbucks losing its authenticity has driven the company from using customers as its primary advertising vehicle, to using national television commercials as an advertising vehicle. Back in March, Paul Williams and I dissected many of these authenticity issues Starbucks faces in a series of back-n-forth blog posts. Together, Paul and I have a combined 19-years of marketing experience with Starbucks and we tapped into that experience to talk strategies and tactics Starbucks could follow to reclaim its authenticity. Our series of posts have been given new relevance since Starbucks has decided to use national television advertising to solve some of its business problems. Re-read, or read for the first time, the laundry list of strategies and tactics Paul and I believe Starbucks could implement to become the company it once was. For even more ideas on how Starbucks can solve its business problems, read what myself and a cadre of other marketing-minded folks have to say in the WHAT MUST STARBUCKS DO? manifesto published online by ChangeThis in April of 2007. UPDATED [Nov. 27]: Starbucks has posted all three of their Holiday television commercials online. You can view them here. 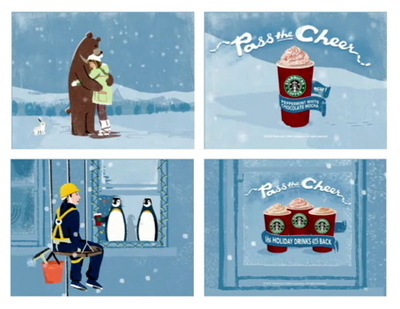 The "Bear Hug" and "Window Washer" spots continue the good Samaritan "Pass the Cheer" angle with the major difference being the focus on the Starbucks Red Cup. The Red Cup is so much more recognizable as being Starbuckian than is the red Christmas Blend whole bean bag (seen in the Ski Lift ad). Lots of c-h-a-t-t-e-r about the television spots Starbucks is running. I haven't seen them on the tele, but Starbucks has posted one spot online. What's your take? Does this television ad make you feel any different about Starbucks? Does it make you want to visit a Starbucks and buy some Christmas Blend? In the comments section, Scott questions how this TV spot syncs up with Starbucks brand identity. The leaping deer, which easily passes for a reindeer during the Holidays, is as iconic to Caribou as the Siren is to Starbucks. Additionally, Caribou uses a pastel aqua-blue color as part of its brand identity. So upon further review, this commercial from Starbucks works better for Caribou Coffee than it does for Starbucks. Ski scenes are more associated with Caribou than Starbucks. A deer is more linked to the Caribou brand than the Starbucks brand. Caribou’s color scheme has always been drenched in an aqua-blue color, while Starbucks color scheme hasn’t. Upon even further review, this Starbucks commercial fails the “Logo Test.” If we were to swap out the Starbucks Christmas Blend bag at the end of the spot and replace it with Caribou’s Reindeer Blend, the commercial would still work just fine. Anytime you can swap out your logo for a competitor’s logo in any piece of marketing collateral and it looks fine, you have a problem. So ... Starbucks, with its first national television commercial, has made a great ad for Caribou Coffee. UPDATE: Click here to watch one of the Starbucks Holiday commercials. On a conference call with Wall Street analysts, Starbucks Coffee revealed fewer customers are visiting its stores and that year-over-year sales are stagnant. The company reported a 1.0% drop in customer traffic as compared to the same period last year and despite two price increases, same store sales increased only 4.0% from the year prior. In response, Starbucks announced a three-point plan to reverse their sluggish financial numbers. First, the company will attempt to sharpen its store-level operations to better deliver the “Starbucks Experience” customers have come to expect. Second, the company will focus on introducing new beverages that are more innovative and more appealing to customers. Third, Starbucks will launch a national television advertising campaign in hopes of driving new customers into its stores as well as getting current customers to visit more often. Since being a publicly traded company, Starbucks has never experienced a reduction in customer visits. Remarkably, they have always had more customers visiting its stores … until now. This is uncharted territory for Starbucks. And Starbucks is concerned. Additionally, for nearly a decade, year-over-year sales at Starbucks have been very strong—anywhere from 7.0% to 13.0%. So the current trend where comp sales are stagnate in the low single-digits is quite alarming for Starbucks. For many companies, the answer to the question of, “Sales are down and customer counts are falling, what should we do?” is to spend marketing dollars on creating a television-heavy advertising campaign. That hasn’t been the answer at Starbucks. As noted in the conference call, Starbucks will continue down the unconventional path of spending marketing dollars to improve the customer’s in-store experience through better store operations and more appealing beverages. But now, the company has also decided to follow the more conventional path to arresting declining sales through launching a television advertising campaign. According to Ad Age, we can expect to see three Holiday-focused animated 30-second spots running on select cable channels and network television channels. This dramatic change in marketing strategy goes to show us how seriously the company is taking the soft comp sales and declining transaction comps. Starbucks is willing to risk its go-to-market strategy by spending significant monies on television ads to lure customers during the Holiday season. To this marketer, it’s a little foolish to spend advertising dollars on television during the Holiday season without going all-out. I doubt Starbucks is putting mega-millions behind this television push. 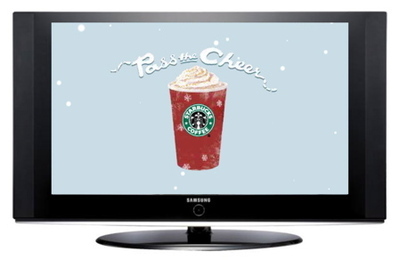 With so many retailers spending mega-millions on television advertising during the Holiday shopping season, the limited advertising spend from Starbucks is sure to get lost in all the ad clutter. Plus, I get the feeling these commercials will be go hard on pushing the relevance of the Starbucks brand during the Holidays and go very soft on selling specific products. A smarter spend for Starbucks would be to go all-out during the Spring/Summer months and use television advertising to promote their promotion-friendly Frappuccino blended beverages. Starbucks has always treated their Frappuccino drinks as being more promotional than their other coffee drinks. 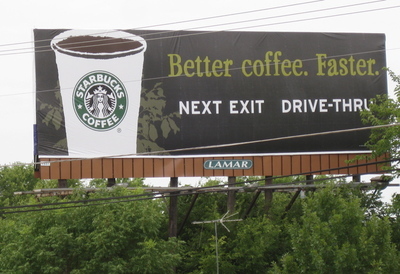 For years, Starbucks has done regional radio, billboard, and print advertising to support their Frappuccino portfolio. They’ve come to believe this advertising push positively impacts sales and drives in new customers. So why doesn’t Starbucks wait until the Spring/Summer months to go all-out with national television advertising? With sales already sluggish and customer traffic trending downward, the company doesn’t want to get too far behind their FY’08 sales goals. Keep in mind, Starbucks will generate around 25% of its 2008 sales during the six-weeks of Holiday. If the company falls behind early in hitting sales targets, 2008 could be a very rough year. 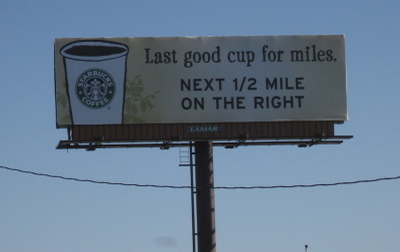 I believe this national television advertising push is a sign Starbucks is desperate to drive sales. Desperate enough to turn its back on the marketing strategy that has made Starbucks what it is today. We all get to sit back, watch the television commercials, and watch to see what impact this new marketing direction has on the Starbucks business and the Starbucks brand. If your appetite for mulling over Starbucks strategies is insatiable, you should review the series of posts Paul Williams and I did earlier this year. In this series of back-and-forth posts, we talked strategies, tactics, and shared some insider knowledge based upon our combined 19-years of marketing experience at Starbucks. Start here and work your way backward. Or, start here and work your way forward. And of course, Jim Romenesko's Starbucks Gossip blog is all over this. Taylor Clark’s STARBUCKED: A Double Tall Tale of Caffeine, Commerce, and Culture is receiving lots of positive ink. The Wall Street Journal loved it. As did the San Francisco Chronicle. It’s being positioned loftily as a “Part Fast Food Nation, part Bobos in Paradise” treatise on coffee and capitalism. Taylor’s book is interesting reading but not necessarily mandatory reading for business folk and cultural studies folk. He traces the Starbucks story well from its inception in 1971 to its impact in 2007. However, it lacks punch. In expected alt-weekly journalism fashion, Taylor, a former writer with Portland’s Willamette Week alt-weekly, runs down the same old story of Starbucks opportunistic and capitalist ways. Yes, Starbucks is hyper-competitive. Yes, Starbucks seeks prime real estate locations. Yes, Starbucks could do more to support coffee farmers. Yes, Starbucks added sizzle to the experience of drinking coffee. Yes, the familiarity of Starbucks brings about opinions of homogenization. Yes, Starbucks charges an ungodly premium for its coffee drinks. Yes, Starbucks has a strong corporate culture ethos. That we know. While I found much of Taylor’s book to cover well-trodden territory, he managed to talk with lots of former Starbucks executive heavies. And the quotes these ex-Starbucks higher-ups shared with Taylor are at times fascinating. I wasn’t expecting to read such sulliable and ego-laden quotes. Which leaves me wondering if these past Starbucks execs weren’t Starbucked. Taylor and I actually spoke some months ago when he was in the process of writing STARBUCKED. I do not recall much about the conversation we had except the writer seemed young and guarded about the angle he was taking with the book. The quotes Taylor includes in the book from me are benign. Then again, I’ve already shared lots of pointed comments about Starbucks on this blog and Taylor had many former executive-level Starbucks people eager to riff about the company they once worked for. Kudos to Taylor Clark for getting ex-Starbucks folks to open up and share some off-brand and at times, acrimonious remarks. I’m sure some of these folks will not be pleased with how they are portrayed. As far as STARBUCKED being a book business enthusiasts would find worthwhile, I don’t think so. Just not enough business knowledge nuggets for us business wonks to learn from. However, the cultural studies crowd might find this book somewhat worthwhile … just not near as worthwhile as Fast Food Nation or Bobos in Paradise. Dannielle Blumenthal has an audacious marketing idea for Starbucks. I think for an idea to be audacious, it must make us squirm ... not squirm a little, but squirm a lot. When an audacious idea is first presented, most businesspeople will believe the idea is ill-advised, absurd, inconceivable, and just too audacious to do. Danielle's idea certainly fits the criteria for being labeled AUDACIOUS. Yep, that idea seems ill-advised, absurd, inconceivable, and just too audacious to do. This should be worth watching. From my emails with the documentary producers, it appears they casted a wide net of talking heads to provide perspective on how and why Starbucks became an endearing and enduring business. LEARN MORE HERE and watch on Wednesday.